There may come a time when you would like to render some 3D objects as 2D billboards. The most common objects for this are probably people, but it can be any 3D object. Maybe there’s a buidling that you want to fade out in your animation because it is distracting from your main focus of a new mall, office building or whatever. For this tutorial I will be using some Populate 3D people, but you can use any type of 3D people or other 3D objects. 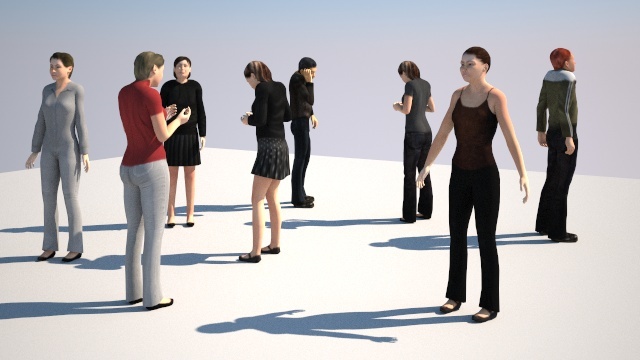 In this scene I just have a VRaySun, VRaySky, VRayCamera, plane and some 3D Populate People. 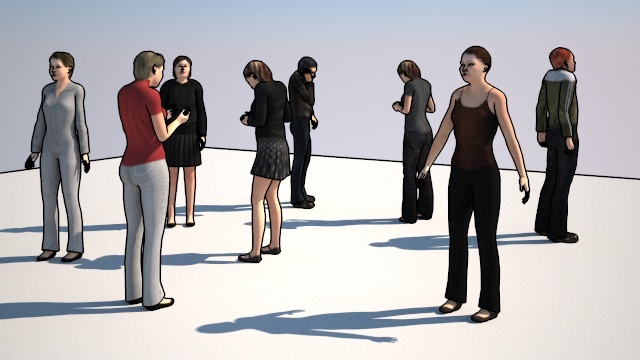 To give the 3D objects an outline, we need to add VRayToon into the Environment and Effects under Atmosphere > Effects. You can find this window in the menu under “Rendering” > “Environment”, or just use the keyboard shortcut “8”. 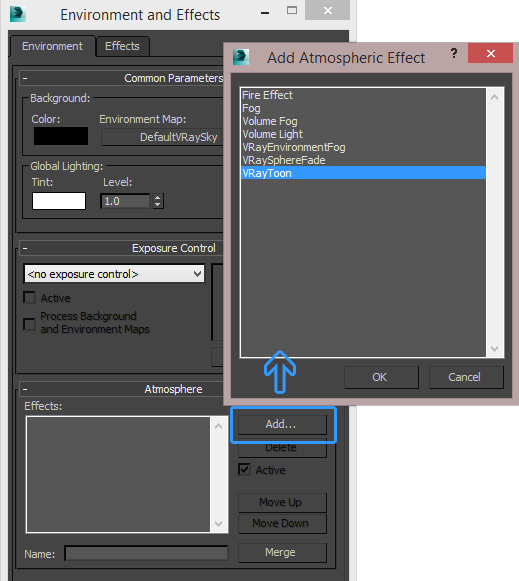 Under Atmosphere click Add… and then from the window that comes up, select VRayToon. Leave the defaults for now. I’ve set Pixels to 2.5 just so the outlines are easier to see. The outlines look ok, but it’s now also on the plane and also in and around people’s fingers, ears etc. 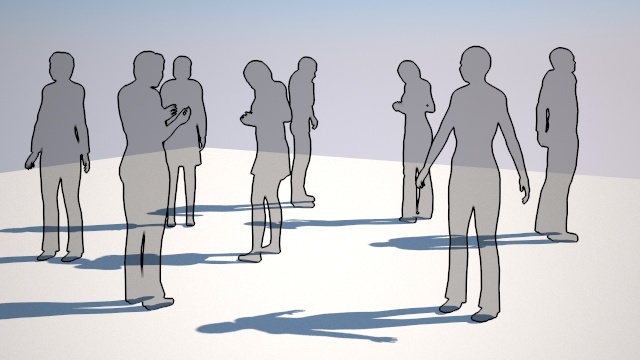 We can exclude the plane from receiving the VRayToon effect, but in a bigger scene with more objects, it makes more sense to just include the people. 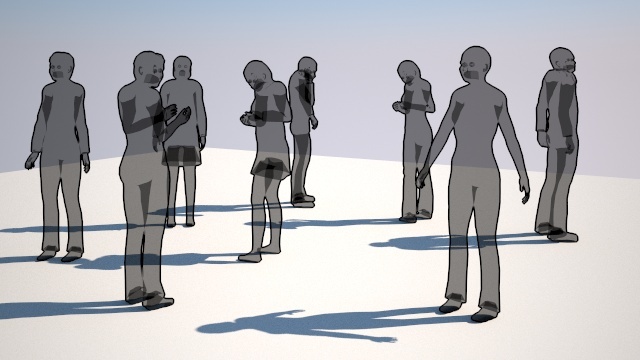 When you exclude objects from VRayToon, it will add the effect on all renderable objects, except the ones you exclude. When you include objects, it will only add the effect on those included objects. 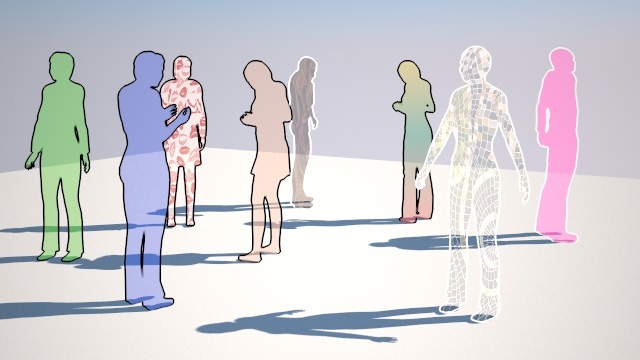 So lets include the people and also “Hide inner edges” so we only get the outlines on the outer edges of the people. You may find nothing happens when you click on Add. At this stage you’re suppose to click each object to add, or the smarter way is just to use the keyboard shortcut “H” to open the Pick Window. Make a new material and apply it to the objects you selected in the include list for VRayToon. The diffuse for glass is usually black (255,255,255) and the colour is derived from the fog. Our toon billboard material will almost be similar, but we’ll get the colour using a different trick. I want the people to be slightly transparent, so I added a medium grey (128,128,128) to the refraction. 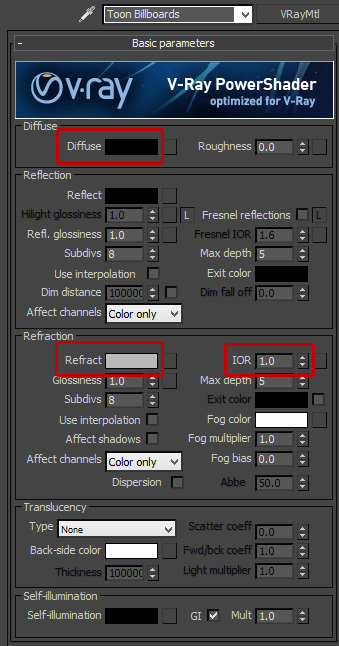 Because I don’t want to bend light or obscure things behind, I’ve also made IOR 1.0. Leave the fog colour white. Something weird is going on, we’re not getting our expected clean seethrough objects! Not a problem, we fix this by changing our objects’ V-Ray Settings and making them invisible to refractions. While we’re at it we’ll also exclude our objects from GI. Since it’s “fake” objects anyways, we don’t want them causing any weirdness. Select your fake billboards, right-click in the viewport and select V-Ray properties from the quad menu. You can change the colour by changing the fog colour, but I want them looking consistent in all conditions so I prefer doing it with the Self-illumination feature of it’s VRayMtl. Untick GI, and you may need to crank up the mutliplier a bit also. A value of 20 seems to work well most of the time with different exposures. You can stick a texture into the Self-illumination slot and with a bit of creativity, uvmapping and some VRayToon tweaking, you can get some interesting results. To get different colour VrayToon outlines, just add another VRayToon effect and split the include list. 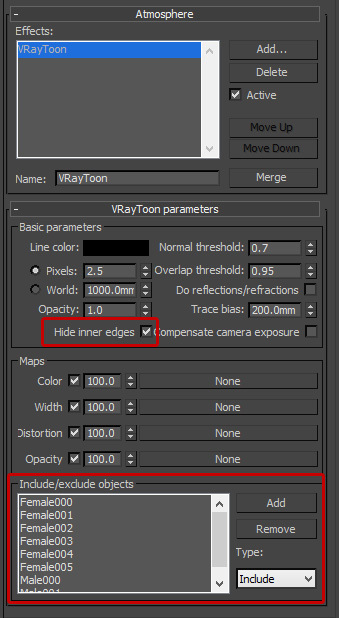 When you want the VRayToon outlines other than black, you may also need to enable “Compensate camera exposure” in VRayToon’s settings. This method will work in most situations. However, there is a drawback and that is that your fake billboards won’t be seen through refractive objects such as a glass window or balustrade. In a later advanced version of this tutorial, I will show you how to overcome this. 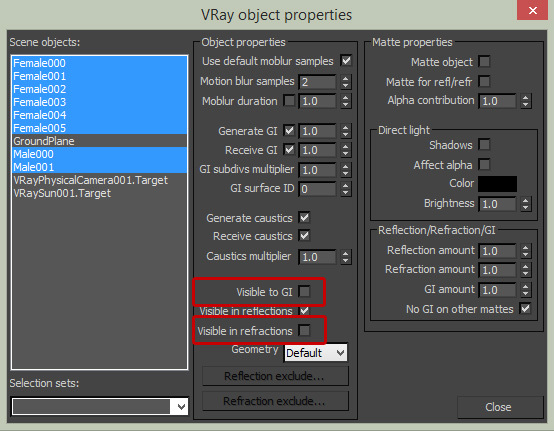 Just a special note if you are on a VRay 3, there is a bug in the Self-illumination multiplier. If you don’t use a texture in there, the object may be darker than expected. ChaosGroup did let me know that this is fixed for the upcoming service pack. Until then you can just stick in a bitmap for the colour you want. This bug does not affect Vray 2.5. Its a nice little trick. I hope you accept that I share this at my Google+ group. Please have a look here where I have added a link to this tutorial. 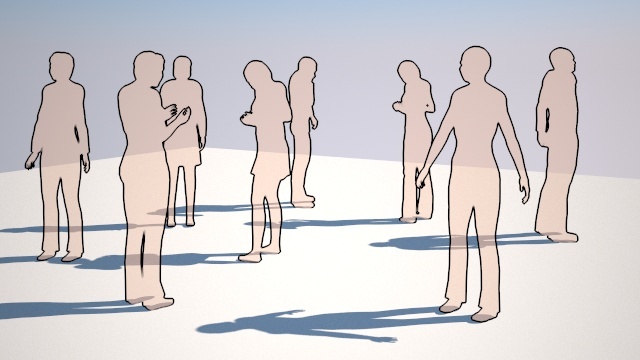 Can I republish this exclusive tutorial in sketchup ur space magazine? Our magazine is very popular among worldwide 3d modeling professionals. Our magazine is recognized internationally and covers the fields of animation, VFX, games, illustration and architecture etc. Yes sure go for it. Be sure to clearly mention my site and please mail me a link once you’ve published.